This article then is all about teaching in a multilingual classroom and the kinds of challenges it offers along with some ideas for making the class work! The most usual place to find a multilingual class is in a TEFL school in an English speaking country. Typically this could be a school in the USA (or UK, Australia, etc) and it will have groups of students from all over the world coming to learn English; they could be there for a couple of weeks in a Summer school or perhaps a month or more on a longer course. As a TEFL teacher you may well find yourself teaching a class consisting of several Chinese students, one or two German, a Turkish student, a couple of Argentinians and so on. Almost any combination is possible and you may find that every single student in the class comes from a different country and speaks a different mother tongue. In cases like this, then, English will be the only common language which is a great starting point: to communicate with each other and you, the students must speak English! This means that far more than in a monolingual class, your students will speak plenty of English right from the start. They will use it not only during the lesson but also to talk to each other outside the classroom. However, there is a downside to having so many different language backgrounds in the class. In teaching a monolingual class you, as a TEFL teacher, will soon become aware that students make the same kinds of error when they speak English. For example, if you teach Italian students you will find that there are problems with count and non-count nouns‏ because Italian‏‎ has a slightly different way of classifying them. Or if you teach students with a Cantonese mother tongue you will find the /r/ and /l/ pronunciation a common issue you will need to practice and deal with in class. These errors come about because of mother tongue influence‏‎ which is the way in which the pronunciation and grammar of the students’ mother-tongue influences the way they learn and speak English. Because each student may have a problem specific only to themselves, the problem for you as a TEFL teacher here is that you cannot stop the lesson and spend fifteen minutes explaining to that single student how to deal with a particular issue which the rest of the class may not have. So, to overcome problems like these you need to firstly keep accurate notes on what problems certain students have and then adopt different techniques for dealing with them. Adopt a general approach and include specific practice in general exercises. By this we mean that if, for example, you have 1 student who has problems with count/non-count nouns then make sure you have a general activity involving nouns which includes practice on count/non-count as well as other noun related practice. The whole class can take part and learn from it in general and you can help the student along as well with their specific problem. Encourage group work. Students will learn from each other so try and mix things up and have, for example, students from very different language backgrounds working together. In the example above involving writing you could put an Arabic student with a Chinese student with a German student and get them writing a group report by hand and checking each other’s writing. Never assume that because most of the students understand a certain point then all the students do. Here you’ll need to check that everyone in the class understands! Be flexible with your homework and allow for setting different students different kinds of homework assignments which will be most useful for them. To reiterate, make a note of the errors certain students have and deal with them at the right time; don’t stop the class for one student. If the error is particularly troublesome, then of course you can put aside time to deal with it on a one-to-one basis. Perhaps if the whole class is involved in a longer project, you can spend time with individual students dealing with their specific problems while the rest of the class works on their own. 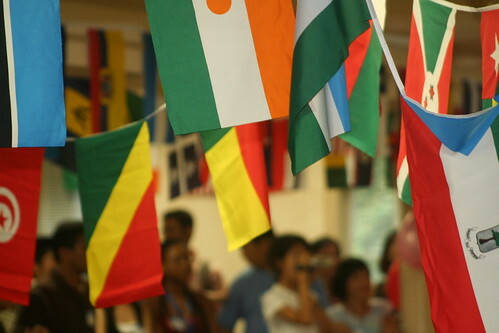 One of the first major issues you will find with a multilingual class is that of culture. Each student may well come from a very different cultural background from their classmates. Of course your classroom is relaxed and welcoming, but if you suggest that two students sit together and there’s an obvious issue (maybe there’s a gender issue or even a political one) simply accept it and allow them to sit elsewhere. Likewise if you are asking various students to speak up in class and there’s an obviously shy student, again don’t force anything but keeping the situation relaxed move on. Of course then it’s time to think about how you can encourage students like this to participate more. See our article on Shy Students‏‎ in your Class for more on dealing with this issue.